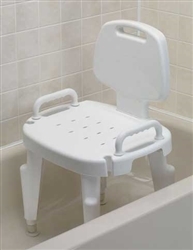 Adjustable Shower Chair from Maddak is a height adjustable shower seat made of durable plastic that supports up-to 300 lbs. It has removable arms and backrest. The shower chair assists in sitting or standing and makes personal hygiene easier. The Maddak Height Adjustable shower Chair has legs that easily adjust from 16-21”. It has a removable back and arms and a built-in hand held shower spray holder. Suction feet help hold the seat in place. The Maddak Shower Chair is easy to assemble and requires no tools. It is durable and rust proof and has a maximum weight capacity of 300 lbs. The bench measures 22.5” x 17” x 7.5”. Height adjustable from 16" up-to 21"